Leicestershire Rugby Union Leicestershire girls are going strong! 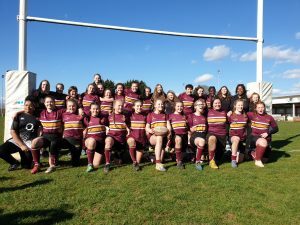 · Leicestershire Rugby Union Leicestershire girls are going strong! Leicestershire girls are going strong! The 2019 girls county program has come an end and we have seen fantastic rugby played over the three Sunday fixtures, in completely different weather conditions. The first fixture was played at Syston Rfc on a morning that dawned with thick fog blanketing the pitches and almost threatened the day’s rugby, but luckily it lifted and we saw a full day of rugby involving four counties at two age groups and three forms of the game 15’s, 7’s and Xrugby7’s. This was a new format for girls rugby, the Leicestershire teams had mixed fortunes on the day results wise but some great rugby played by all four CB’s. Thank you to Syston RFC for helping us host the Event. The second fixture was at Rugby Lions and was against Warwickshire at both age groups. The weather was again interesting, with a very strong wind all day interspersed with rain, hail and snow. The rugby was again top class despite the conditions and our thanks go to Warwickshire Rugby Union for organising the fixture at short notice, after the original venue fell victim to the weather. With Leicestershire U18s beating Warwickshire 21-0. The U15s narrowly going to Warwickshire 12-10. A great effort by all including Rugby Lions in hosting at such sort notice. The final fixture was again at Rugby Lions for the u15 and at Walsall Rfc for the u18, the weather was kind to us and great rugby was played in glorious sunshine. Leicestershire were playing Staffordshire at Both U18s and U15s. The U18s came back from being 14-10 down at half time to win 27-24 in a very close game, to win both of they full fixtures. The U15s eventually ran 15-0 winner with three great team try’s. After a lengthy injury breaking and having change pitches( a neck injury to the Staffordshire left wing get well soon). This year Leicestershire Rugby Union appointed new coaching teams for both u18 & u15 squads who have done a great job. David Challenger, David Young at U18s & Ofure Ugiagbe ( Fuzz to us all ) Jenny Renton. Development coaching roles were also appointed to David Kennedy at U18s and Eleanor Wilkinson at U15s. Well done both of you. Finally a thank you to all the players and parents throughout the programme you have been fantastic.